Improper diet, no body massage, hormonse imbalance, less diet, calcium deficiency etc. create complaints like joints pain, knee pain, neckback pain, Leg cramps, spondilitis, slipdisc, muscle sprain, sitica, swelling, gass, stomach bloating, body pain, bonepain, parkinsons vertigo etc. Vatshaanti is developed on all such Vatvikaras. Pollution & allergic conditions disturb body health. 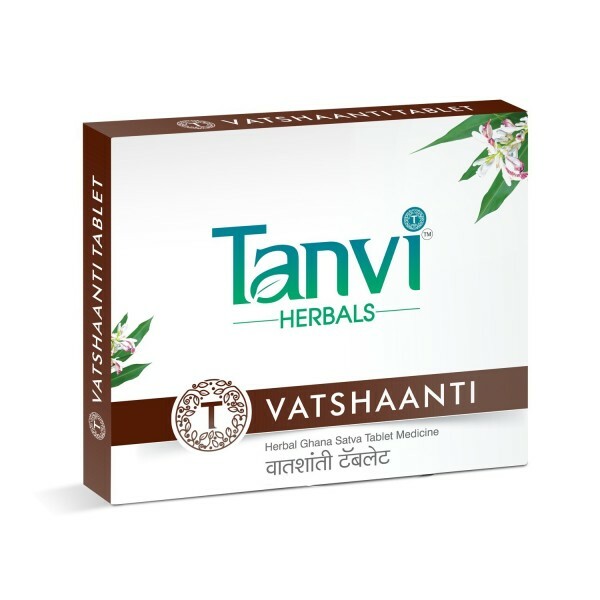 Vatshaanti works as a pollution resistance tonic for health & fitness. Avoide curds, banana, guva, custard apple & start the use of Vatshaanti. It will help you a lot in your health complaints. Thats why many patients are using 2 Tanvishataa, 1 Vatshaanti regularly as a fittness tonic & enjoying life. In cronic complaints Tanvishataa 1, Vatshaanti 1 & Shatajivanti 1 work well as a best combination. Vatshaanti can be used as a natural pain killer also. when severe joints pain or bodypain is there take 2 to 4Vatshaanti tablets with luke warm water for faster relief & apply Ketki oil. When you start Vatshaanti, your moods will change to happy feelings, allergies will come down, you will feeel better, lighter & energetic. continue Vatshaanti regularly as a fitness tonic or take as & when required. To reduce body heavy feeling, lack of wrist strength & in old age deficiencies 2 Tanvishataa, 1 Vatshaanti, 1 Ashwayashtee will work as a good calcium & Vata Tonic. In allergies like psoryasis take 1/4 tab Santhakaphaa, 1 Vatshaanti, 2 Tanvishataa, 1 Tanvijyeshta orally & apply Ubtan Joy Liquid on Wet skin. Massage for 2 minutes & then wash off. Vatvikara when controlled, health automatically gets shaped up to fitness. many have blessed Vatshaanti to be a best health tonic which they are taking regularly. There was severe pain, stiffness, swelling & due to that walking was very much painfull but 21 22 23 24 thanks toVatshaanti ..... because of Vatshaanti we enjoy walking ..... we feel healthy ..... now there is no knee pain, cramps, numness. It is easy to sit & getup &climbing stairs dont make us breathless now. Vatshaanti has made our miserable life a happy journey again. These emotional feelings of many patients give real satisfaction of making products like Vatshaanti by serving Ayurveda. Because of easy to use tiny Tanviherbal Tablets enjoying good health with Ayurveda is very easy.